Martyn Hilbert's Railway Photography - Last additions - GKN 0-6-0 370 Cardiff Steel (Tremorfa). GKN 0-6-0 370 Cardiff Steel (Tremorfa). With the barriers down across a public road, GKN 370 a Yorkshire Engine Company 0-6-0 shunter - 'Carlisle' (2755/1959), transfers a load of glowing furnace waste in the Tremorfa Steel Works complex on June 28th 1981. 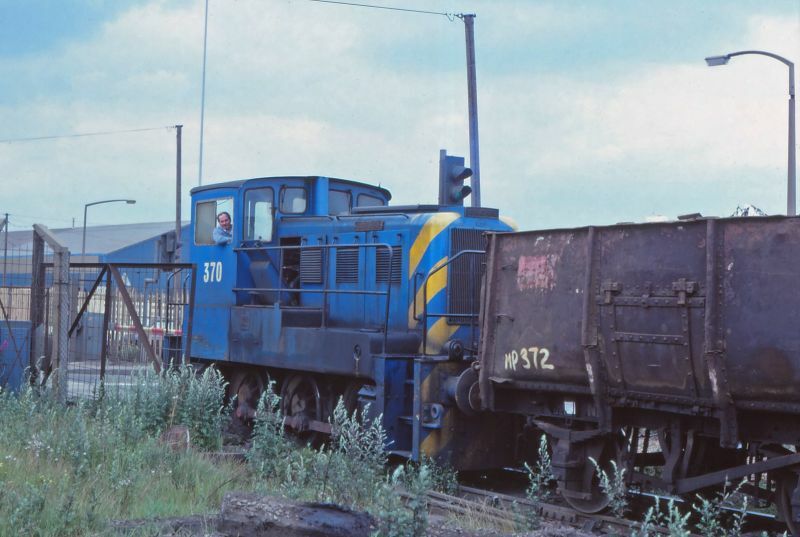 The locomotive started life with the Port of London Authority but as the London Docks contracted the fleet were sold on. The heat from the load in those battered ex BR 16 Tom Mineral Wagons was quite intense!